Interior construction detail. Implementation of the conceptual section will reflect events from the occupation, resistance and liberation of Khorramshahr. 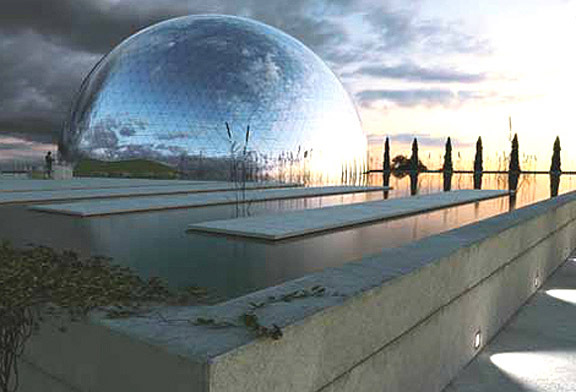 Artist's rendering of the completed Panorama Museum of the Sacred Defense. Additionally, a digitally rendered piece of artwork will be permanently exhibited within the southeastern part of the Sacred Defense Museum Garden. This is probably the most worthwhile project to honor the millions who gave the ultimate sacrifice for Iran. Khomeini was personally responsible for three quarters of those lives lost.The war could have ended in 1982 but the hateful old man wanted to go to "Quds" via Karbala instead. Yeah he wanted to end the war in Iran's favour back in 1982 .But the mullahs did a palace coup and had him deposed.He out of all people should have known what types of charlatans these characters are. But Iran couldn't let an invasion go unpunished, a counter-invasion is the least Iran could do, and it would have worked had it not been for Arabian oil and Western military aid going to the Ba'thist regime in Baghdad. Saddam was foolish, he'd have done it again had Iraq not become on the defensive for 6 years. At the UN negotiating table Saudi Arabia was ready to compensate Iran on behalf of Saddam's mistake by granting Iran a gift of 70 Billion US Dollars (without having to pay it back! ), and this proposal came about after the Iranians had liberated 99% of Khuzestan. Khomeini and his clerical henchmen turned down that one-in-a-life-time offer and opted to foolishly pursue their much propagated strategy of toppling the secular Baath party by conducting an aggressive military campaign. Naturally the reaction, as would be expected, was that the Saudis dropped that gold chest in the lap of the Iraqis to be spent on defensive measures. Nothing wrong with that. Rest assured, Saddam wouldn't have done it again since one of his closest friends was involved in brokering a major deal between him and Khomeini and going in with high stakes. An Iranian acceptance to the Saudi initiative to commence negotiations would see Saddam blocked from attempting any further attacks on Iran, on so many grounds. Also perhaps you are not aware of the fact that the Iraqi military was four times bigger and stronger in 1988 than in 1980, whilst the Iranian military was several times smaller in terms of equipment compared to what they had when the war started. The Iranian military was in shambles towards the end and could no longer prevent the Iraqis from liberating Iraqi soil and could not even repel the Iraqis as they launched fresh offensives into Iran again. The Iraqi forces went into Iran, just as in 1980, in what looked like a second invasion and rampaged without anybody being able to deter them. Iran was literally saved by the unanimous angry and condemning voice of the entire international community at the UN where they pressured Saddam to withdraw his troops back across the border. USMC documents released after the war revealed some chilling facts that the Iraqi armed forces in 1988 could easily have moved all the way to Ahvaz to occupy it, and this time the Iranians would not have had the strength to recapture any of it. This regime and all of its groupies need to count their lucky charms. Their lucky charms are the US and UK secret backers of the mullah regime.